and before the ingrowth of granulation tissue. I. Obtain history of bleeding. 2. 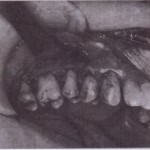 Use atraumatic surgical technique. 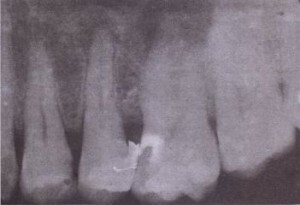 this second premolar to remove granuloma because risk for sinus perforation is high. the precise source of bleeding. 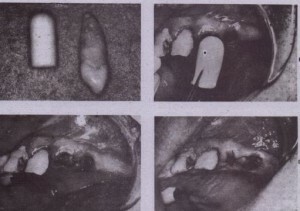 If it is clearly seen to be ageneralized oozing, the bleeding site is covered with a folded, damp gauze sponge held in place with firm pressure by the surgeon’s finger for at least 5 minutes. FIG. 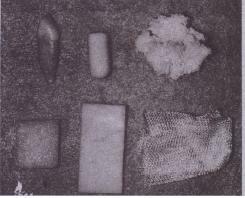 11-13 Material that can be used in a bleeding socket. suture isplaced over the socket to maintain the collagen in the socket. 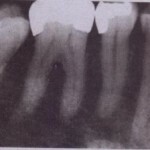 should gently curette out the tooth extraction socket and suction all areas of old blood clot. The specific area of bleeding should be identified as clearly as possible. As with primary bleeding, the soft tissue should be checked for diffuse oozing versus specific artery bleeding. The bone tissue should be checked for small nutrie t artery bleeding or general oozing. The same measures described for control of primary bleeding should be used. The surgeon must then decide if a hemostatic agent should be inserted into the bony socket. The use of an absorbable gelatin sponge with topical thrombin held in position with a figure-of-eight stitch and reinforced with application of firm pressure from a small, damp gauze pack is standard for local control of secondary bleeding. This technique works well in almost every bleeding socket. In many. situations an absorbable gelatin sponge and gauze pressure are adequate. The-patient should be given specific instructions on how to apply the gauze packs directly to the bleeding site should additional bleeding occur. Before the patient with secondary bleeding is discharged from the office, the surgeon should monitor the patient for at least 30 minutes to ensure that adequate hemostatic control has been achieved. If hemostasis is not achieved by any of the local measures just discussed, the surgeon should consider performing additional laboratory screening tests to determine if the patient has a profound hemostatic defect. The dentist usually requests a consultation from a hematologist, who orders the typical screening tests. Abnormal- test results will prompt the hematologist to investigate the patient’s hemostatic system further. A final hemostatic complication relates to intraoperative and postoperative bleeding into the adjacent soft tissues. Blood that escapes into tissue spaces, especially subcutaneous tissue spaces, appears as bruising of the overlying soft tissue 2 to 5 days after the surgery. This bruising is termed ecchymosis (see Chapter 10). removal. careful asepsis and thorough wound debridement a fter surgery can best achieve prevention of infection after surgical flap procedures. This means that the ‘area of bone removal under the flap must be copiously irrigated with saline and that all foreign debris must be removed with a curette. Some patients are predisposed to postoperative wound infections and should be given perioperative prophylactic antibiotcs (see Chapter 15). slough off in 2 to 4 weeks. If the irritation of the sharp bone is low, this is the preferred method. 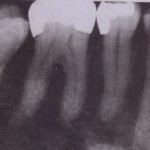 If a bone file is .used, 110 flap should be elevated, because this will result in an increased amount of exposed bone. The file is used only to smooth off the sharp projections of the bone. This procedure usually requires local anesthesia. Patients who are -quite annoyed by the sharp bone will usually choose this method . 3. Close incision over intact bone. single therapeutic goal of relieving the patient’s pain during the period of healing. If the patient receives no treatment, no sequela other than continued pairi exists (treatment does not hasten healing). Treatment is straightforward and consists of gentle irrigation and insertion of a medicated ‘dressing. First, the. tooth socket is gently irrigated with saline. The socket should not be curetted down to bare bone, because this increases both the amount of exposed bone and the pain. Usually the entire blood clot is not lysed, and the part that is intact should be retained. The socket is carefully suctioned of all excess saline, and a small strip of soaked with the medication Is inserted into the socket. The medication contains the following principal ingredients: eugenol, which obtunds the pain from the bone tissue; a topical anesthetic, such as benzocaine and a carrying vehicle, such as balsam of Peru. The medication can be made by the surgeon’s pharmacist or can he obtained as a commercial preparation from dental surgery houses. The medicated gauze is gently inseted into the socket, nd the patient usually experiences profound relief from pain within 5 minutes. The dressing is changed every-day or every other day for the next 3 to 6 days, depending on the severity of the pain. The socket is gently irrigated with saline at each dressing change. Once the patient’s pain decreases, the dressing should not be replaced, because it acts as a foreign body and further prolongs wound healing.